Radiation from the Fukushima plant is flowing into the ocean at a rate of 300 tons per day. In recent days, the severity of the meltdown at Fukushima’s Daiichi nuclear power plant has compounded, with news that radioactive water is seeping into the groundwater and flowing into the neighboring harbor at the alarming rate of 300 tons per day. According to Kinjo, the contaminated water, which registers a level of radioactivity above legal limits, breached an underground barrier and proceeded to rise to the surface. Kinjo said that Tokyo Electric Power’s (TEPCO) “sense of crisis is weak,” adding, “This is why you can’t just leave it up to TEPCO alone” to address the catastrophe. He added that the countermeasures proposed by TEPCO are only a short-term fix. This doesn’t come as a surprise. A similarly short-sighted decision was made in the first few weeks of the crisis to pump tens of thousands of tons of toxic water into the Pacific in an emergency move. In many ways this decision – made in a pinch – set the precedent for the way the crisis would be handled going forward. Since the outset of the emergency at the Fukushima plant, triggered by the triple disaster of 3/11, TEPCO’s handling of the crisis has been a lightning rod for criticism. Alongside its lack of pre-quake preparation for the kind of disaster that ensued and its bungled response, the operator of the plant has also been accused of covering its tracks with disinformation and secrecy. The latest development is no exception. 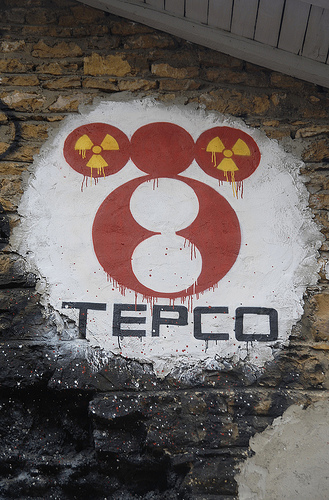 Until now Tepco has been daily directing 400 tons of groundwater from the hills nearby the site into the basements of the plant’s ravished buildings. The groundwater mixes with the toxic water and helps keep the reactors from boiling over the 100 degrees Celsius mark. It remains uncertain how much danger this contaminated groundwater poses. “Until we know the exact density and volume of the water that’s flowing out, I honestly can’t speculate on the impact on the sea,” said Mitsuo Uematsu from the Center for International Collaboration, Atmosphere and Ocean Research Institute at the University of Tokyo. Officials from the beleaguered utilities giant first admitted to discovering something awry in the water near the plant in July, revealing that they had detected large amounts of reactor byproducts tritium, cesium-137 and strontium-90 both in test wells nearby the site and in the harbor just beyond. The announcement made July 22 angered fishing unions and frightened customers over the impact the leak would have on the nation’s food supply. Fish caught within 20 kilometers of the coast near the plant revealed record-high levels of cesium in the fish. Closer to the plant, things aren’t so simple. While pumping water into the plants has at least kept things cool, the issue of groundwater seepage poses a more fundamental problem. Workers have attempted to prevent leaks by injecting chemicals into the ground to harden its surface and seal it off – to no avail. “Instead of fixing the wall in the basement to stop the groundwater leakage, they can’t because the building is uninhabitable,” said Michael Friedlander, a former nuclear plant operator and engineer. This leaves few options. Friedlander mentions two: dumping the water into the ocean or evaporating it. Faced with this reality TEPCO has been forced to instead store the irradiated water in more than 1,000 huge tanks – hardly a long-term solution. “We’re in uncharted territory here,” Friedlander added. This is hardly reassuring given how this crisis has unraveled until now.